There were mistakes and misses on a rainy day, but what this game did have was valour, four goals and the best Andy Moran dancing since Gene Kelly, of Mayo stock, ran up the walls in Singing in the Rain. On this day 40 years ago Dublin beat Kerry in the game many offer up as the greatest ever. Yesterday in Croke Park, Kerry and Mayo were up there with the best in so many ways. The old values of giving all for your team and your people were there for all to see on this Sunday to savour forever. Two teams washed away the dour and dross football seen earlier this summer with blood, sweat and tears. The ball moved quicker up the field than stolen goods. There was very little messing about once both teams realised that to linger on the ball was an invite to join the ranks of the dispossessed. But was it wet. Soaking wet. Right through to the underpants wet. It was all down to a stormy, cracked girl called Gert who started out on her destructive journey to Ireland from somewhere in the Caribbean. There was that sense of fear and worry men get when they are waiting to tell a bunny boiler the love affair is over. Yet as we crossed the Liffey early yesterday afternoon, the big river had no more ripples than if a blow-up doll jumped into the bath. Hurricane Gert was more downpour than storm and the levels of skill were excellent on a slippy pitch. There was no bouncing the ball on the run and little wedges need plenty of back-spin to keep between the lines. Mayo left only a skeleton staff back home. Never has there been a county with such a desire to be able to say to their grand- children and great-grand- children: "I was there." Never have more women backed their men. The ratio of women to men was almost even. And if Gert was destructive, the women of Mayo were steadfast and loyal. We met Rose of Tralee Maria Walsh with the wonderful Brenda Donoghue. Maria is the new Ireland - of the brave, the smart and the fair. Remember Mayo and Kerry aren't exactly a tram ride, or a couple of bus stops away from Croke Park. Kerry will travel in greater numbers next week. It was never a question of waiting for the final. There's only so much in the kitty and this is our busy time. Mayo had heroes all over the field. Moran scored the first goal and several spectacular points thereafter. Andy is the best man to slip away from his marker since Michael Collins rode his bike through the streets of Dublin. Kieran Donaghy was marked by Aidan O'Shea and he had the better of Aidan, who is no man-marker. Donaghy made the first Kerry goal and he missed a few when his legs went near the end but he led from the front, as ever. Aidan should have been left free to rampage. It was like asking Van Gogh to paint the porch. So many men stood up but Peter Crowley stood tallest of all for Kerry. Peter gave up Puck this year and he has never been as fit. Peter was given the dual mandate by Éamonn Fitz. He was free to attack and defend, on a needs-be basis. The Mayo forwards caused Kerry a lot of trouble. Tadhg Morley helped out at full-back and at least Mayo weren't scoring goals. I felt sorry for the full-back line who were left exposed time and again. Mark Griffin made a series miraculous goal-line saves when Kerry were on the ropes and the corner men were uncorking the smelling salts. The only sweepers in use in Kerry are in the broom cupboard. But that's the way we play and the less than pragmatic part of me is proud of Kerry. Small boys and girls will have dreamt last night of a game played for the glory of it. Keith Higgins had another mighty game. There were times when it would have taken a Siamese twin surgeon to separate him from James O'Donoghue, who had some fine moments. Crowley went in hard on Higgins just after half- time. But up jumped the Mayo man, even though he was shaken. If he stayed down and rolled around, it could have been a card. Chivalry is still alive even in the middle of tense shoot-outs and unforgiving jousts. 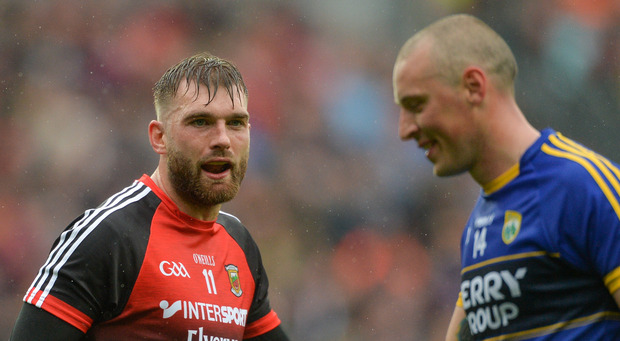 There were some incredible points from Mayo's Cillian O'Connor. He kicks the cover off the ball. I'd say Cillian is very hard on socks. For Kerry, young Jack Savage linked up to make several scores and the just as young Jack Barry fired up midfield in the second half. I had just surfaced for air in the ever-hospitable Croke Park Hotel. Donaghy comes over and says "sorry for putting you through that". The players don't really know what a superb show they put on for us. Players are mentally and physically drained after big games like this. Éamonn Fitz is a very even- tempered man, who has the hardest job in football. He smiles serenely and simply says: "Billy, we're still in it." I get a hint in that one-liner that he feels Kerry have more in them. And if Kerry get over Mayo on Saturday, well then that will be the makings of them. In the early part of their season every game Mayo won was more like a stay of execution than a victory. I wonder though could this be their year? Mayo have improved with matches. Kerry badly needed a tough game. But Mayo have been written off at least once a week. The whole of Ireland, and the Irish abroad, will be watching next Saturday. For this is who we are, when we are at our best.